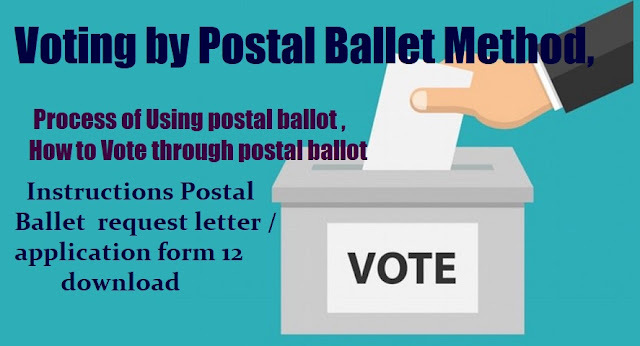 Process of Using postal ballot by Employees, teachers and staff participating in electoral functions Voting by Postal Ballet Method, How to apply for postal ballot, cast the Vote through postal ballot Instructions to employees who are serving election duties and form 12 download . Postal Ballet Voting Method, processs. Voting is a voting process, where all electors receive their ballot papers through the post. Depending on the system applied, electors may have to return their ballot papers by post, or there may be an opportunity to deliver them by hand to a specified location. Voting by Postal Ballet Method, Process to Vote through postal ballot Instructions , Postal Ballet request letter / application form 12 for general elections download from here. 3 . SMS ద్వారా ఓటు ను గుర్తించ వచ్చు. Postal voting Method Brief Intruction : Postal voting is voting in an election whereby ballot papers are distributed to electors or returned by post, in contrast to electors voting in person at a polling station or electronically via an electronic voting system. Historically, postal votes must be distributed and placed in return mail before the scheduled election day, it is sometimes referred to as a form of early voting. It can also be used as an absentee ballot. However, in recent times the model in the US has morphed, in municipalities that use postal voting exclusively, to be one of ballots being mailed out to voters, but the return method taking on alternatives of return by mail or dropping off the ballot in person via secure drop boxes and/or "voting centers." Postal voting refers only to the means by which the ballots are submitted, not to the method by which the votes are counted. Election officials may count the votes by processing the mailed-in ballots through electronic voting machines, or may count the votes manually. To enable as many voters as possible to participate, postal voting can assist people who may not be able to attend a polling station in person, for example because of a physical disability, absence from the locality or some other reason. Postal voting is generally available to voters upon application, sometimes with restrictions. If no reason for a request is required, it may be called postal vote on demand. Postal voting may be an option for voters in some jurisdictions, while in some elections there may be all-postal voting. Click here for Postal Ballet request letter / application form 12 for general elections download from here.